August 28 — Spiderweb for Two! I just recorded the second chapter of Spiderweb for Two. It’s the one where Cuffy tells a wonderful story about her childhood on a farm in Wisconsin and her adventures with a boy named Francis. Back in May I went to the bookstore to buy a gift for my soon-to-be-born niece. 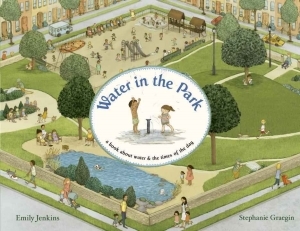 While I was there I spotted a charming picture book, Water in the Park, about a park in the big city and all the water-related things that happen there on a hot summer day. It was so well-written and had such lovely illustrations, the kind that have lots of interesting details to examine, that I just had to buy it for someone!